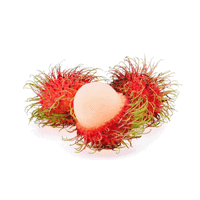 Rambutans are high in fiber, an excellent source of iron and a good source of Vitamin C.
Choose rambutans with intact skin and no breakage or leaks. Store rambutans in a plastic bag in the refrigerator for up to 2 weeks. To eat a rambutan, peel off skin and remove the grape-like flesh. The flesh contains an inedible seed, so be careful when eating. Eat alone or add to salads or desserts. Ramutans are a relative of the Lychee and has a spiky red shell covering a sweet grape-like flesh. An inedible seed is contained within the flesh, so be careful when eating!